Whether you’re the new kid in a cubicle, the boss in the executive suite, or self-employed, you have huge potential for greater productivity and fulfillment. Even very high performers in excellent organizations—large and small, for profit and nonprofit—report that 30 to 40 percent of their talent is untapped. Imagine what lies waiting for you. 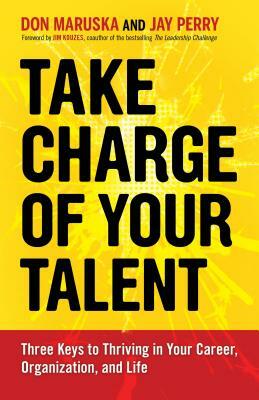 Take Charge of Your Talent details three keys to develop and enjoy your abilities. You’ll discover new ways to identify your aspirations and opportunities, power past obstacles, and translate your intentions into results. Finally, you’ll create a personal brand with enduring career assets that will multiply the payoffs for yourself and your organization. Don Maruska founded and was CEO of three Silicon Valley companies and now inspires and guides leaders and teams around the world to be their best in their work and careers. He is the author of How Great Decisions Get Made. Jay Perry is one of the founders of Coach University and the International Coach Federation and has over two decades of experience bringing forth the creative genius of people in all walks of life. "I&apos;ve seen the key practices in Take Charge of Your Talent work with hundreds of people--from front-line employees to CEO. Read it and help your career and your organization thrive." “The gem of Take Charge of Your Talent is that it re-enforces the (often lost) reality that there are opportunities at any time, in any business climate. It is the prospect for meaningful productivity using your unique talents that lights the fire.